Why Mila Kunis + Ashton Kutcher do a 'no presents' Christmas - Motherly Inc.
Christopher Ashton Kutcher is an American actor and investor. 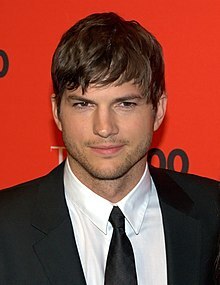 Christopher Ashton Kutcher (/ˈkʊtʃər/; born February 7, 1978) is an American actor and investor. Kutcher began his career as a model and began his acting career portraying Michael Kelso in the Fox sitcom That '70s Show, which aired for eight seasons. He made his film debut in the romantic comedy Coming Soon and became known by audiences in the comedy film Dude, Where's My Car?, which was a box office hit. In 2003, Kutcher appeared in romantic comedies Just Married and My Boss's Daughter and, the same year, he created, produced, and hosted Punk'd which aired on MTV for five seasons until its revival in 2012. In 2004, Kutcher starred in the lead role of the psychological film The Butterfly Effect and gained public recognition. Kutcher subsequently appeared in more romantic comedies, including Guess Who (2005), A Lot Like Love (2005), What Happens in Vegas (2008), and No Strings Attached (2011). From 2011 to 2015, he starred as Walden Schmidt on the CBS sitcom Two and a Half Men. In 2013, Kutcher portrayed Steve Jobs in the biographical film Jobs.